Greg Damico first saw Bird on a trip to San Diego. He likes that you can leave the scooter anywhere when you're finished with it. Thursday Bird began testing its dock-free electric scooters in Cincinnati to the delight of many riders in Over-the-Rhine, Downtown and The Banks. Greg Damico was checking one out in Pendleton Thursday morning. "I first saw them in San Diego a couple of weeks ago. I love them because you can jump on them wherever you find them and when you get off you leave them where you're at and just go." The scooter, which travels up to 15 miles per hour, costs $1 per ride and 15 cents each minute. It is locked and unlocked via a smartphone app. The company says this is a pilot project in Cincinnati and it's still trying to determine the neighborhoods where people will ride them most. "We are looking forward to testing our affordable, transportation option with the people and communities of Cincinnati, as they recognize the need for an accessible and reliable transit system," a company spokesperson says in an email to WVXU. 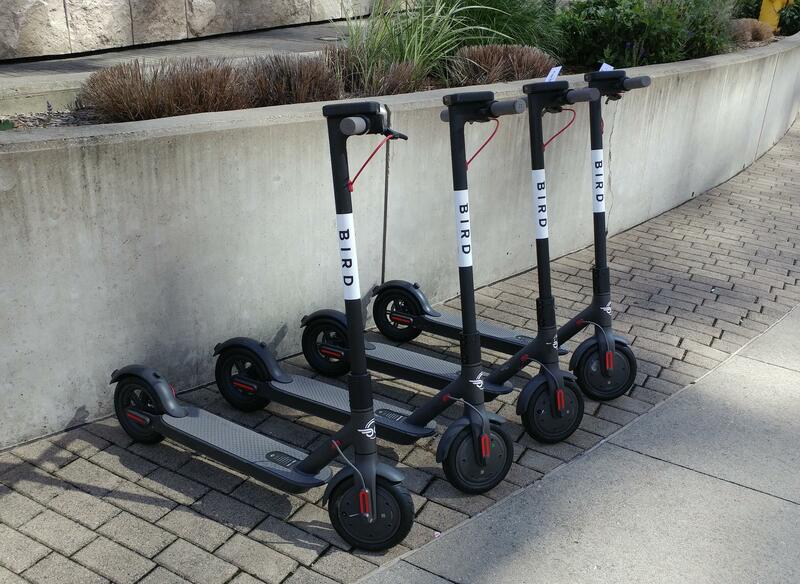 Bird sees the scooters as "perfect for last-mile trips." Locking and unlocking a Bird scooter -- spotted outside the Freedom Center Thursday -- is done through an app on your phone. Not everyone, though, is a fan. Reaction on Twitter was mixed, with one person saying he prefers to walk and another saying the scooters clutter sidewalks. The company hires people to collect the scooters and recharge them overnight. Too, not all cities are embracing Bird. There have been complaints about injuries, lack of attention to traffic laws and people leaving the scooters in the middle of sidewalks. Louisville kicked the company out Friday. In an emailed statement, the city told WVXU it learned of Bird's launch here Thursday morning. "Given that we just learned of the matter, we are still in the process of evaluating the possible impact on neighborhoods," the statement read. Indianapolis recently passed an ordinance regulating Bird and other scooters. Other cities have done the same. Bird says it is nogotiating with Louisville and hopes to be back there. There’s a new way to get around downtown and Over-the-Rhine. Adding to the fleet of Uber drivers, bike shares, pedal wagons and the streetcar, you can now hop on a golf cart. Cincinnati City Council voted in May on an ordinance that set up a three-year pilot program for these low-speed vehicles.